Plastic Pallets | Elkhart Plastics, Inc. The engineers at Elkhart Plastics can help you design a plastic pallet to best fit your application or process. Our high quality, rotationally-molded plastic components are designed for the agriculture, chemical, food processing, and material handling industries. Our continued research into new technologies, materials, and processes makes us the best fit for your pallet needs. 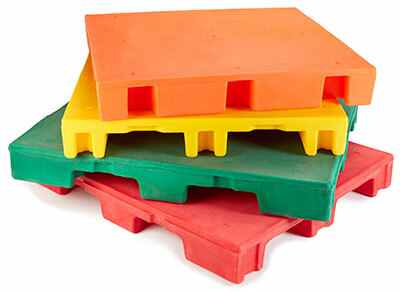 We are an American company that provides the highest quality rotational molded plastic pallets. With our large capacity for production and multiple locations across North America, Elkhart Plastics, Inc. can help you accomplish your goals. Elkhart Plastics manufactures custom rotomolded solid-wall pallets providing material handling solutions in both standard and custom designs for a variety of markets such as printing, pharmaceutical, manufacturing, food processing, food, and chemical. With or without optional steel-reinforcements, our plastic pallets are the best alternative to pallets made of wood and other plastics. Since our company opened in 1988, Elkhart Plastics, Inc. has engineered and manufactured a variety of plastic pallets for the agriculture, chemical, food processing, and material handling industries. In addition to rotationally molding the plastic pallets, we also provide customized secondary assembly services. This product is manufactured in our Middlebury, Littleton, and Ridgefield plants.